P. Zaccaro Co. Inc. Real Estate (click for detail), 225 Lafayette St.
and J. Eis & Son (click for detail), 105 First Ave.
P. Zaccaro was Philip J. Zacarro (1895-1971). He appears in city directories as early as 1912, and is listed in 1916 as a partner in the firm Bonomolo & Zaccaro, located at 192 Bowery (near Spring St.). In 1917 Zaccaro registered for the World War I draft when in business for himself at this address. He was the son of Frank and Anna Zaccaro, and was recorded in the U. S. Census of 1900, age 3, when the family lived at 343 E. 34th St. Frank Zaccaro's occupation was "Boot Black." In 1910 the family lived on E. 29th St. Philip, now 14, was third in the list of 7 children. P. Zaccaro & Co. first appeared in the New York telephone directory in 1918 at 192 Bowery. In 1936 the business office moved to 1 Spring St. and in 1938 to 225 Lafayette St. 225 Lafayette (corner of Spring St.) is the address that appears on the sign. The telephone number in 1938 was CANAL 6-1212, which can be seen as part of the underpainting at the top of the J. Eis sign. This remained the telephone number of the business and its location until Philip Zaccaro's death in 1971. Subsequently the offices moved to 218 Lafayette St., where they remain at this time (March 2009). The business is now run by Philip Zaccaro's son, John Anthony Zaccaro, born 5 April 1933 in the Bay Ridge section of Brooklyn. John A. Zaccaro is the husband of Geraldine A. Ferraro, who in 1984 was the vice-presidential candidate for the Democratic Party. J. Eis was Jacob Eis (1874-? ), and the original son was Hyman Eis (1899-?). Both father and son registered for the World War I draft in 1918. But this was before Eis & Son came into being. In 1918 Jacob Eis worked as an operator on trousers for Harry Slupsky at 17-19 Bleecker St., and Hyman Eis was a clerk at Louis D. & N. Waxberg, 23 Ludlow St. Louis D. & N. Waxberg were in the hardware business, and it was in 1922 that J. Eis & Son, hardware, came into being at their first location, which was 26 1st Ave., near the corner of 2nd St. Their business moved in 1933 to 105 1st Ave. This was a few blocks further uptown, between 6th and 7th Sts. They are still in business here (as of March 2009), and had this sign on the front of the building in 2005. The business name changed from Son (singular) to Sons (plural) in 1948. The second son was Aaron Eis (1904-1972). Jacob Eis was listed among the passengers on the S. S. Belgravia sailing from Hamburg, Germany, 6 May 1904. The ship's manifest recorded his last place of residence as Lutowiska and said that he was sailing to New York to join Mendel Eis at 81 Ridge St. Mendel Eis was possibly a brother. Mendel Eis immigrated to New York in 1887 on the S. S. Bohemia sailing from Hamburg 26 June 1887, and his last place of residence was recorded as Lutowiska, Österreich. Lutowiska is currently (March 2009) located in Poland about 270 km. east of Krakow, near the Ukrainian boarder. 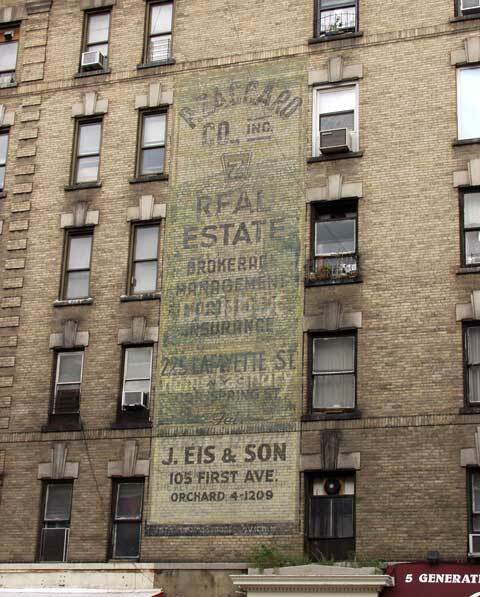 The Eis telephone number Orchard 4-1209 indicates that this sign was painted during the time frame 1940 to 1948. This ad for J. Eis appeared in the Civil Service Leader, Tues., 22 Dec. 1953, p. 14. By this time the telephone number had changed to Gramercy 5-2325.